Wow! 0% from Rotten Tomatoes for The Smurfs! What the smurf happen? Luckily it actually went up to 19% favorable review the next day. I disagree with the rating because I think the movie deserves more than 19%. It was mindless fun to watch and the kids in the theater loved it. See how cute they look in this poster? 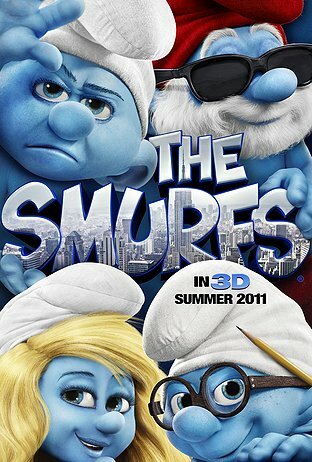 I grow up watching The Smurfs and was looking forward to watch this movie. I have some of the old cartoon at home and as I was rewatching them, I realized they do use the “Smurf” word quite often. I have no idea why there are so many complains on the high usage of the word “Smurf” in the movie. All the characters are very cute especially Smurfette. The CGI was well done. I wasn’t into Neil Patrick Harris’ character as much as his character in How I Met Your Mother. Neil Patrick Harris just didn’t convince me with his seriousness personality. Jayma Mays was very sweet.